It’s worth noting that the useful life of an air conditioning system is considerably shorter than the useful life of a subway car. Honestly, the fact that the MTA has 31 year old air conditioners where most of the units are still functional is an impressive achievement. A testament to their skills at maintaining ancient equipment long past its expiration date, which they have a lot of experience doing. The old, not-ozone-friendly charged systems could last upwards of 30 years in stationary usage. Subway cars move, obviously, but there’s not too many potholes in a steel rail, and the system were presumably hardened for mobile use. I recall a fridge from around WWII that was still running in 2000; couldn’t take it along when I moved, unfortunately. They don’t make ’em to last that long no mo. When the scheduled maintenance comes around for the R62A, they should at least see if it is possible to add HVAC systems. That would help make it easier to maintain in the long run. Although thoae are great ideas, unfortunately the way those cars were designed in the 80s prevents them. For the CBTC, lets use the 7 lines R188 (and converted R142 cars) as a perfect example. When the MTA designed the 142s in the late 90s, they had cbyc in mind. The cars were designed to allow space for its installation. And of you ride the 7, you can still see that some of the cbtc equipment was added inside the passenger area as well (right inside the cars next to the very first side door behind the operator’s cab). Now if they camt add a second compressor to the older fleet, they definitely cant add cbtc equipment. Actually, with the future open car sets its going to worse. Not only will it be necessary to take half a train out of service to fix one car, it will be necessary to take out the whole thing. For a bigger and worse issue, check out chart 10. Subway mean distance between failure is falling on a 12 month moving average basis, which smooths out any one month hiccup. Those reading here know what the increase in MDBF meant to the recovery of the subway system. It is as if NYC violent crime was soaring on a 12 month moving average basis month after month, and no one talked about it. R211 will be 5 car sets so it will only be half a train taken out of service. Also, air conditioning units are mounted to the top of the trains. They take them off the train and drop a replacement in while the work on the broken ones. Not usually too much time out of service. Well that’s good news. But the point is, there are tradeoffs. More room, but still five car sets, although I guess that makes more sense than less room and five car sets. Meanwhile, why is MDBF falling? NOP, AC units are not on top of trains. Here’s what I find even more concerning about that – check out the breakdown by car model on page 30. While the R32s have the single worst decline in reliability (41.5%), second and third place go to the R142A and R143 cars (34.6% and 31.2%, respectively), with the R160s also seeing a 20.5% decline. Now, one years worth of data may not represent an overall trend but as of this report some of the system’s largest declines in mechanical reliability are coming from some of its newest equipment. As it is, the R142A and R143 cars are already statistically less reliable than every older model still in service except the R32 and R42. If this trend continues it does not bode well going forward. I do wonder what their most common modes of failure are, and how many of them have anything to do with the fancy electronics in the newer cars. The cars on the 1 are 30 years old?! Wow… I remember when they were brand new. Yup. Only 20 more years to pay off the bonds. They issued 30 year bonds about the time the cars were bought, and then re-borrowed the same money for 30 more years in 2000. Even in 2000, with the city, state and country rolling in dough, Generation Greed didn’t want to pay the freight for its share of the ongoing renewal of our transit system. And rationalized the whole thing away. Ha Ha! 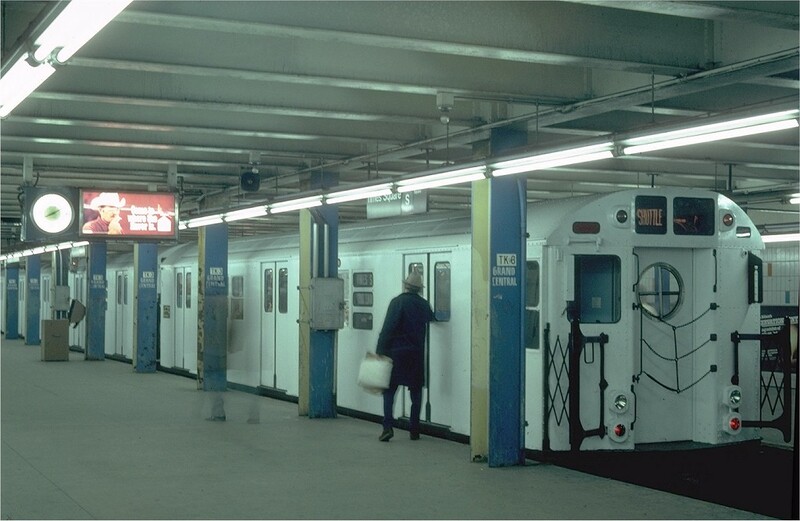 I can remember watching on the news Mayor Ed Koch touring mock-up of the new subway trains on order, and all of the anti-vandalism features being built into them! Why is it so warm inside the subway system, underground? This drives me crazy. It should be 50-60°F year round. I assume its a lack of vertical ventilation. Caves stay that sort of temperature because they have little air mixing with outside and no significant internal heat sources. The subway system, by contrast, is ventilated so its temperature goes up and down as the temperature outside does. And it has lots of internal heat sources (trains, lights, people) so it will always be hotter than outside unless it is air conditioned. The biggest heat source is the A/C on the trains. It’s a mixed blessing; cooler trains mean hellish platforms. I wouldn’t hurt if the pawement which forms the roof of most subway tunnels weren’t dull black. There is such a thing as light colored pavement, and even with oil and rubber deposits it’s still far more reflective than weathered asphalt. Along with that, add cooling towers at the high points and intakes at the lows, and you’d get at least a small continuous venting effect. Naturally, the brand new and very expensive 2nd avenue subway stations will be fully climate controlled, right? Similar to the new 7 line station, yes. Hmm, I wonder if that means that there will be very long escalators from mezzanine to the street, yet not a single escalator down to the platform (like Hudson Yards)? To compliment what you write here…I have a list of weak/broken AC R68 cars in my Google Keep for almost 3 years. Many broken AC R68 cars have a common problem of unbelievably hot car seats. I have been in Japan and always admire their heated car seats during the winter. The broken AC R68 cars is exactly like that, but at the wrong time. What’s more irony is that during the winter, R68 D trains are among the coldest car I have ever been on. When the temp outside dropped into teens, I have to put everything on to not make myself shivering inside the car. As one would expect, I never feel the warmth of car seats in winter! The irony here is that with the AC problems with the R-32 on the B division, the MTA has a partial summer fix of putting them on the J/Z line that operated mostly outdoors, so that the problems the run into due to the heat in the tunnels on the C line aren’t a factor. The MTA definitely has made improvements in terms of maintenance. Although, the R40s were delivered as air conditioned, for many years before they were overhauled, the A/C was functioning on only 10 to 20 percent of the fleet. It was especially uncomfortable since there weren’t any fans and only a small portion of the windows opened. I was just in London, and realized New York is somewhat lucky to have Air Conditioning at all. Many of the lines on the London Underground (Piccadilly, Central, for instance) have no AC at all. It’s not quite as warm there, but there’s still a few weeks each year that unpleasant is just the beginning of the story.